There’s only one way to end the current practice of resellers getting obscene prices or discounters taking all but a fraction of the income for your tickets. Stop making it so easy for them. Broadway offers a good example of what not to do. Do only tourists and suckers pay full price? Every Monday afternoon, The Broadway League releases the weekly sales data for every show performing on the Great White Way. Currently, about 60% of all Broadway tickets are sold below the face value of the ticket. When the results of “never-discounted” shows (The Book of Mormon, The Lion King and Wicked) are deducted, the proportion of discounted ticket sales jumps to nearly 70%. Last week, for instance, total Broadway sales revenues (about $33 million) were about two-thirds of their aggregate gross potential. In non-peak weeks, this ratio floats closer to 50%. To the resellers go the best seats. While the market is flooded with overpriced inventory that can only be sold at deep discounts, the best seats in the house are offered at premium prices in the primary market, at theatre’s own sales outlets and prices of $200-$300. For the most popular shows, the secondary market pushes the prices for these prime seat locations into the stratosphere. And, the revenue? It’s out of producer’s hands at that point. Resellers are filling the consumer demand void and taking the profits. The devil’s in the mid-range detail. Broadway isn’t alone. In TRG’s observation of the nonprofit world, we see a similar breach in pricing strategies. The best seats are almost always undervalued while everything else in the house is overpriced. Most governing boards, managers and the media focus on a few top-priced tickets. But, success is defined by what happens with those seats in the middle of the price table. What drives pricing at the top? Hope. Ego. Ambition and envy. Whatever the driving emotion, there’s a self-defeating notion at work that says: the higher the top price, the greater actual income will be when the ticket is sold at 50% off! Prevailing wisdom also says that if a performance sells out, the price was probably right – regardless the original price point. But, if the price was truly right, why are so many being sold at a discount? Why are so many tickets being sold at huge and silly prices? 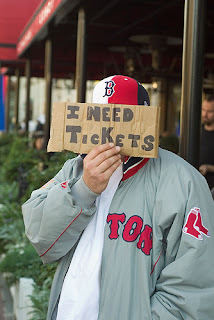 My previous post makes the case that traditional supply and demand theories generally don’t apply to tickets. Buyer Preference, an economic term that translates in our world to “programming,” plays a central role. When Buyer Preference is high, demand for tickets will drive up the acceptable price for any ticket. The seat’s gotta be good enough. Buyer Preference also shows up in the emotion that surrounds seat location. Make no mistake. The more loyal and knowledgeable patrons are, the greater the likelihood that emotion will drive their seat preference. Who buys most of the tickets we sell? While politically incorrect, the answer is: Highly Educated Wealthy Older White People (HEWOWP). HEWOWPs care about seat location. They care about it a lot. They care so much that unless they can secure a “good enough” seat location, they may just pass on the performance altogether. On Broadway, Premium Seats are the answer to “good enough”. Mel Brooks is generally credited with originating the concept when he opened the smash hit, The Producers. His brilliantly simple idea was to price best seats at about $150 (in today’s dollars). The best of the best seats, however, were priced even higher – $250 or $300. It worked great when premium seats at premium price found an audience. If not, they were sold at the regular top price. The problem is that this A-B choice of prices at the top leaves a huge gap in the middle of the price table. Many HEWOWP’s will happily pay more than $150 for a great seat. Many will not pay $300. Enter the unemotional broker. Because resellers have no emotional attachment to the product or artistic merit, the retention of patronage, the risk of production – or anything, except the deal itself – they have an easier time of finding the buyer’s sweet spot. Does Mr. or Ms. HEWOWP want to pay $180? How about $225? For resellers, it’s only about the deal. Period. Big gaps in the price table create openings for third parties to operate safely and profitably, exploiting the demand created by others. For arts managers and producers, understanding the math and data behind the emotional attachment to seats is a huge advantage. It’s the fuel that drives profitable, sustaining pricing and inventory management plans. Control your own inventory. Close up the gaps of your price table. We are talking about micro-segments of the audience that can deliver macro-results. It’s doable with a bit of creativity and sound transactional data available in any competent ticketing system. Yeah, it requires a bit of extra work on the front end to really understand the numbers that drive the emotion of a ticket purchase. But why make it so easy for third parties to take what you should be earning?